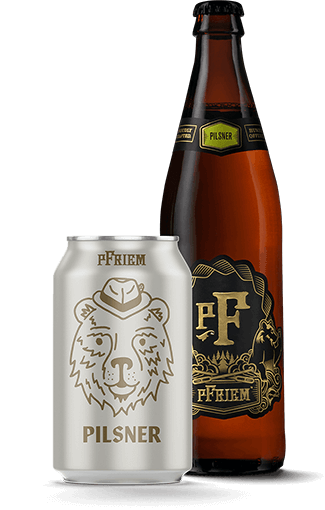 Authentic Oktoberfestbier can only be brewed within the city limits of Munich, but that didn’t stop our brewers from crafting pFriem Festbier with aromas of fresh bread, notes of toffee and a rich refreshing finish. So while we may have taken Oktober out of our Festbier, we’re pretty sure your taste buds won’t miss it. Technically, authentic Oktoberfestbier is brewed only by the breweries within the city limits of Munich. These are also the only breweries allowed to participate in the annual Munich Oktoberfest. All other beers brewed to emulate the original must be labeled Oktoberfest-style beer. In spite of their name, Oktoberfest beers are not brewed in the fall. They are actually an outgrowth of the traditional, strong spring brews, called March beers or Märzen, that were put aside in ice-filled caves or cellars for summer consumption. The left-over Märzen was usually finished off... in Okotober, when the fresh beers made with the grain and hops from the new harvest season needed to be put into casks. Oktoberfestbiers, therefore, are always well-aged, sometimes for three to four months. They are usually deep amber in color and have an alcohol content of 5 to 6.2%. Deep gold to sunset orange topped with bright white foam. Aromas of fresh baked bread with a touch of toffee. Biscuit flavors with hints of caramel. Finishes slightly sweet, rich, and refreshing. Charbroiled steak, venison, pork, and grilled meats in general. Grilled vegetables such as peppers, zucchini, onions, and squash. Dry rubbed barbeque, baked ham, and macaroni and cheese. Sausages work great, especially the spicier types. Battered fried fish, crab cakes, and smoked trout.